Crestron’s CEN-NVS100 provides a simple solution for streaming video to touchpanels throughout a building. The CEN-NVS100 is an MJPG encoder that converts high-resolution video to streaming media, allowing easy monitoring of door entry cameras or any other video feed. The CEN-NVS100 accepts full motion video up to D1 resolution and encodes the signals as either MJPG or MPEG4. It works with touchpanels that feature the Crestron MJPEG Viewer application, such as the TPMC-8L, TPMC-8X, and TPMC-4XG. 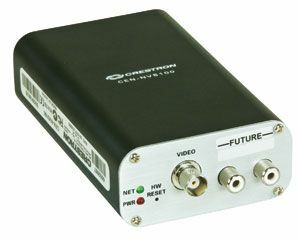 Simultaneous dual video streams are supported by the CEN-NVS100, and options include text and time stamp overlay, as well as privacy masking that allows any segment of the video image to be obscured. Up to three motion detection windows can be defined, enabling automated events in response to movement within specific onscreen areas. Events can also be triggered when a loss of signal is detected. The CEN-NVS100 can control a pan/tilt/zoom camera via RS-485, communicates with the control system over Ethernet, and is PoE (Power over Ethernet) compatible.